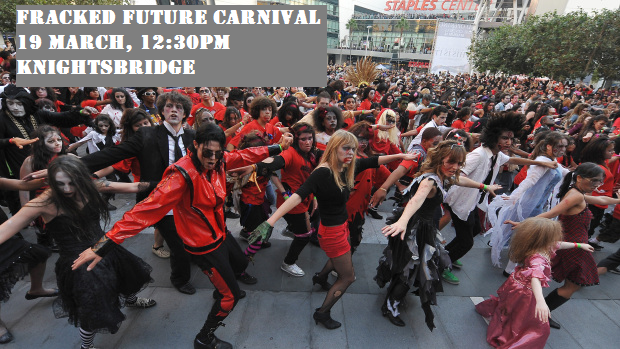 TOMORROW – Fracked Future Carnival!!! We’ve been working hard to bring you a fun and creative day of demonstration against the unconventional fossil fuel industry. There will be speeches, face painting and dancing. If you can’t attend, the event will be live streamed from here. We’ll also be live tweeting all of the festivities. So be sure to follow Frack Off London on Twitter. Below is the full call out. – Kayla from Brighton and Hove Energy Service Co.
On 19 March, the CEOs of IGas, Cuadrilla and various government officials are attending the Shale Gas Forum (http://marketforce.eu.com/events/utilities-energy/the-shale-gas-forum) to plot new ways to bring fracking to the UK. We know fracking won’t lower our bills and it won’t bring significant jobs. But it has the potential to ruin our land, our water, our soil and will keep us dependent on fossil fuels. But we won’t let them frack our future! Meet us outside Knightsbridge station at 12:30. The theme is “Fracked Future”. Bring anything that represents the toxic legacy that this industry will leave if it takes off. Come dressed as a zombie or ghoul. Bring along your gas mask, chemical suit and/or chemical cocktail. There will be music, speakers and events. Also bring food for a picnic as we plan to be there for the long haul. Please follow Frack Off London on Facebook and Twitter for updates. See you on 19 March!! !